This map illustrates satellite-detected flood waters over the affected Regions of Omusati, Oshikoto & Oshana, Namibia, as of 19 March 2008. Flooded areas have been sorted into 2 classes: Red areas represent standing flood waters identified with a high degree of confidence; and Blue areas represent pre-flood water levels in July-November 2007. Estimates for flooded areas per constituency have been calculated in km2. 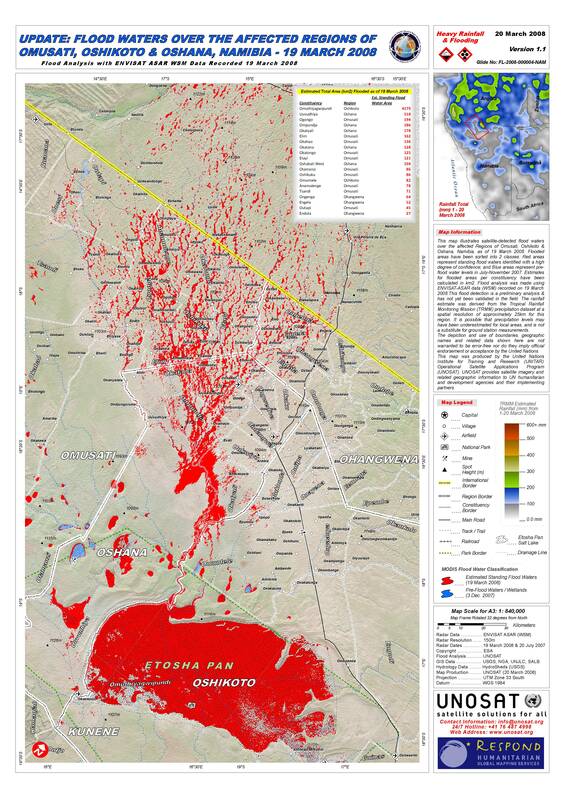 Flood analysis was made using ENVISAT-ASAR data (WSM) recorded on 19 March 2008.This flood detection is a preliminary analysis & has not yet been validated in the field.